A job well done has paid off for Geography and Environmental Studies students at Wilfrid Laurier University. 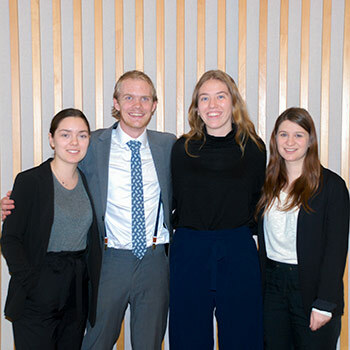 As part of a competition in Laurier’s Capstone Urban Sustainability Project (CUSP) course, the City of Cambridge has awarded cash prizes from private sector donations to senior-level Geography and Environmental Studies students for their contributions to a current municipal project. The fourth-year course challenges students to apply their understanding of human and physical geography while refining career-ready skills. The most recent CUSP project, led by Laurier Associate Professor Bob Sharpe, focused on updating the City of Cambridge’s Heritage Properties Register with more commercial and industrial sites. Ana Savic, Danya Tugg, Leyla Mains and Andrew Westerveld, of the student consulting team Great Lakes Heritage, received the top prize of $2,000 for the best overall project. Buildings listed in Cambridge’s heritage properties register undergo a review process before they can be demolished; adding properties to the register is a safety measure to ensure that a building’s history can be properly captured. To date, the city has identified 223 commercial and industrial buildings constructed before 1950. Tugg’s team assessed 25 properties in the city’s Hespeler neighbourhood for po-tential inclusion in the heritage register. Using city-defined criteria and the Ontario Heritage Act, the team reviewed building features and researched property dates and owners. By the end of the project, Tugg’s team recommended 21 sites for inclusion in the register. The team also created a series of promotional materials to increase awareness about the heritage register. They shot and edited two videos that explain the importance of including heritage properties in the register. They also designed digital and print ads, and a series of letters for the city to distribute to residents. Castlewood Consulting’s student duo, Regan Lalone and Aaron Shantz, received a $1,000 prize in the best research category. Alanna Crawford, Lisa Tang, Ivy Jiang and Mackenzie Bell of Heritage Urban Planning also received a $1,000 prize for conducting the best community outreach. The quality of work that comes from CUSP students continues to impress city staff. Waldie says that the research conducted by Sharpe’s students gives the city a good foundation to learn more about particular properties. For Tugg, the project offered insight into the working world of an urban planner, a field she is considering after graduation. “I’ve learned a lot about the consulting process through this experience and how to conduct a project to meet the needs of the client,” says Tugg. Tugg plans to use her portion of the first-place prize money to fund a research field experience to the Yukon in August. With the generosity of the City of Cambridge, Paul Puopolo (BA ’73) and Louise Puopolo of Polocorp Inc., Christopher Coupal (BA ’95) of Coupal Markou Commercial Real Estate Inc., Stephen Rhodes (BA ’88) and Wanita Rhodes (BA ’87) and Laurier’s Department of Geography and Environmental Studies, the Capstone Urban Sustainability Project is able to give students the opportunity to use their skills as Geography and Environmental Studies majors and to gain comprehensive knowledge about the consulting process. CUSP is part of C3 Innovation Labs (C3IL), an arts-based initiative, which offers experiential learning opportunities to students across the “three Cs”: campus, city and community. C3IL includes a variety of courses, internships and other experiential learning opportunities for Laurier students to enable them to engage in complex social challenges on campus, in the city and community, and apply their education to create and test innovative solutions. C3IL programming is open to all Laurier students. For more information visit www.wlu.ca/C3-innovation or email c3innovation@wlu.ca.